Traveller or Tourist? Yes, there is a difference. 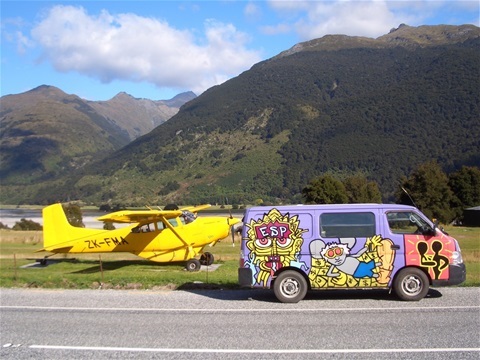 The van is ours, the plane not. I suspect you guessed that. There’s a lot to be said for having a secure base, a solid home life surrounded by friends and family. So they keep telling us. We're comfortable with all of that, but also enjoy a very different way of life. Twenty-five or so years ago we decided on a radical course of action: abandoning good jobs, friends, family and moving to a country where we knew nobody, didn’t speak the language and, in the absence of an income, would be forced to live off our wits. Not exactly on the spur of the moment, but about as close to an instant decision as it's possible to get. It wouldn’t suit everyone, that modified version of living on a desert island. Only people comfortable in their own and each other's company should attempt it. An absence of interest in material possessions will help as well. Treating life as an adventure has its rewards, but it’s not suited to everyone. At first we renovated old houses. Ruined houses may be a better description. The places nobody with any sense would buy, which made them cheap. We restored them to life, added value, sold them on and bought another wreck with the proceeds. One year we lived completely 'off the grid' without access to electricity in a remote location, renovating an abandoned bergerie , and saw barely a single other person in the whole year. That was extreme, even for us, but more typically we came across locals, had a social life, just a very different one from 'back home.' We certainly didn't do all this for the money, but we earned enough to live on, just about. Over twenty years flew by and other factors came into play. We’d lived in France, Spain, North Africa; had experiences denied to most people, but it was time for a change. We came back to England, renewed ties with friends and family, and bought a house. Became traditional householders again with a library card, a bus pass, and all the trappings of genteel respectability. A couple of years ago, we went wandering again. In a small camper van with very few mod. cons. Eastern Europe; former USSR states in the main. Places we’d never visited. We loved it. The life suits us. Travelling doesn’t have to have a specific purpose. It can be a means of experiencing different cultures, different ways of life. When we travel our needs are few, costs are low, yet our lives are enriched. We love mountains. Love deserts. Love the relaxed way of life on deserted beaches far removed from the tourist trail. We’re travellers, not tourists Tourists drop in for a week, maybe two. Go to places where other tourists go. See what other tourists see. We go to different places. Have very different experiences, immerse ourselves in a land very different from our own, and mingle with different cultures. We’re travellers, you see. We lived abroad for twenty odd years, renovating a variety of ruined houses in France, Spain and North Africa. ‘Doing-up’ houses in order to sell them and buy another ruin allowed us to keep the wolf from the door, but by its very nature was hard work and tied us down for the duration of the project. Afterwards, as bone fide 'travellers' in our bijou van, we wandered at will, woke to a different view every morning or stayed put for a while to savour a new region and all it has to offer. I’m liable to bore you now by talking about camper vans as we've been having ongoing discussions about them over the past few weeks. We often stop to look at an interesting conversion. Marigold's obsession is the weird conversions; the flatbed lorry with an old caravan welded on the back, the old ambulance or fire truck and especially those metal boxes on massive wheels built to cross the Sahara and other equally inhospitable places. 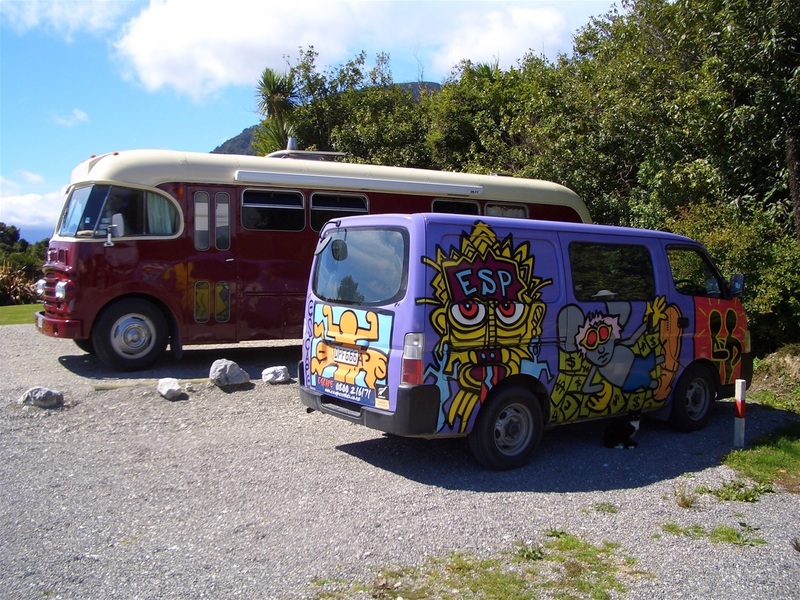 Should we get another van, or carry on as we've done this trip, with a car for travelling and hotels/hostels for sleeping? Ah, now that is the question and so far unresolved. 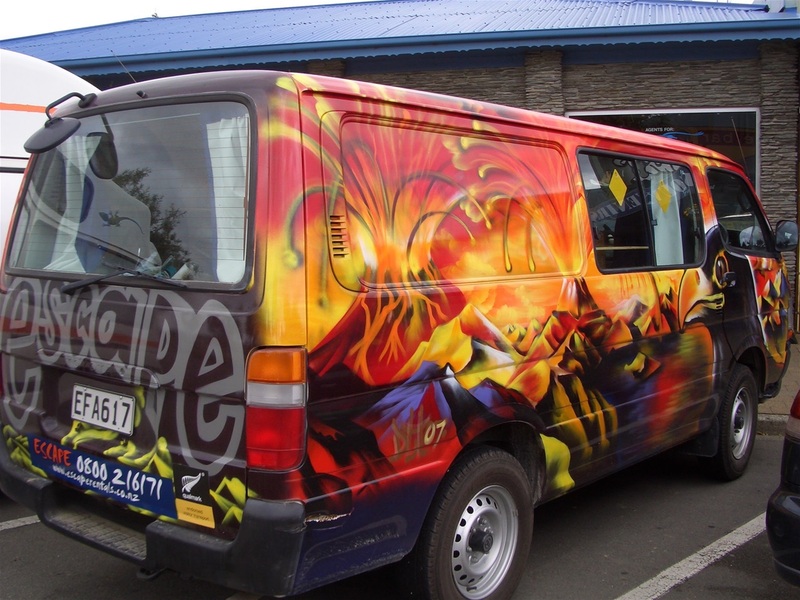 If we buy another van, and it's a big if, what should we get? We’ve come across all sorts on our travels. 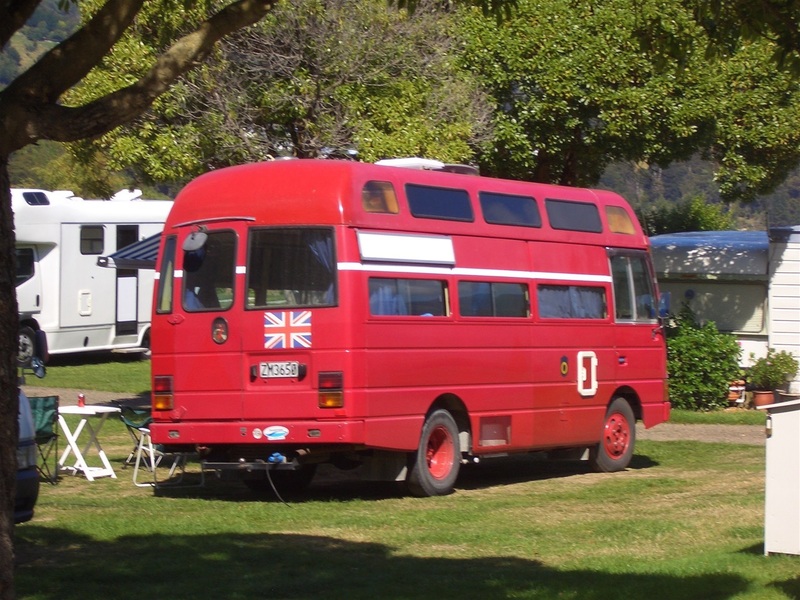 I’ll never forget watching 89 old buses now converted to ‘campers/mobile homes’ boarding the ferry from North to South Island in New Zealand. Yes, I did count them – nothing else to do while we waited our turn in our farty little VW camper. 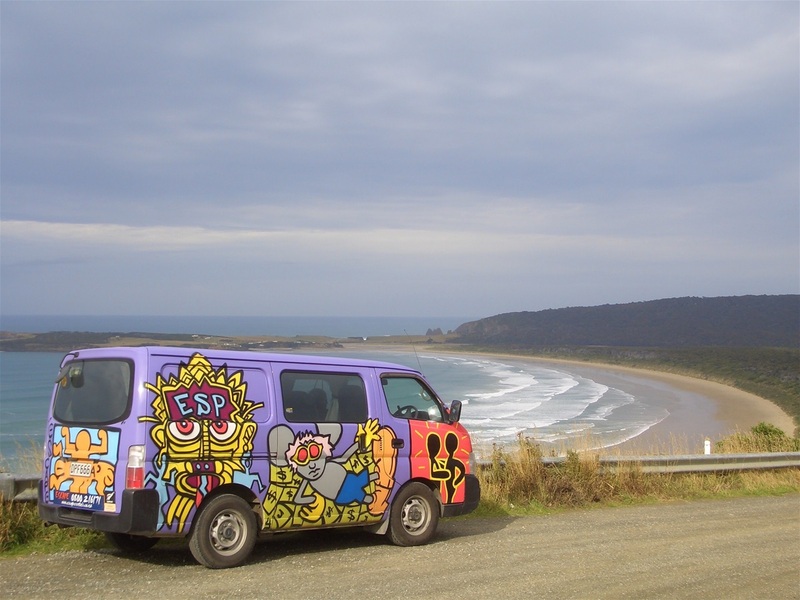 Six weeks in that little VW, complete with wacky cartoons all over it, was a fantastic experience. We went everywhere, both islands, moving on when the mood took us and it was this trip that re-energised our wanderlust. Waking on the shore of the Blue Lake or in a weird campsite at Cape Kidnapping made us realise what we were missing. I can’t remember the exact equivalent in English pounds of five bucks, but trust me, five dollars is pretty cheap. We drove in, didn’t see the dog – never did see the dog – and parked up. There were a few of the mobile homes we’d seen many times before: old caravans, and I mean really old, which had been extended, usually a brick or block room or rooms added and curtains and all the trimmings included. Not fancy and no longer ‘mobile’ but very much a ‘home.’ At the far end of the field, right by the seashore, were a group of those buses we’d seen all over New Zealand. 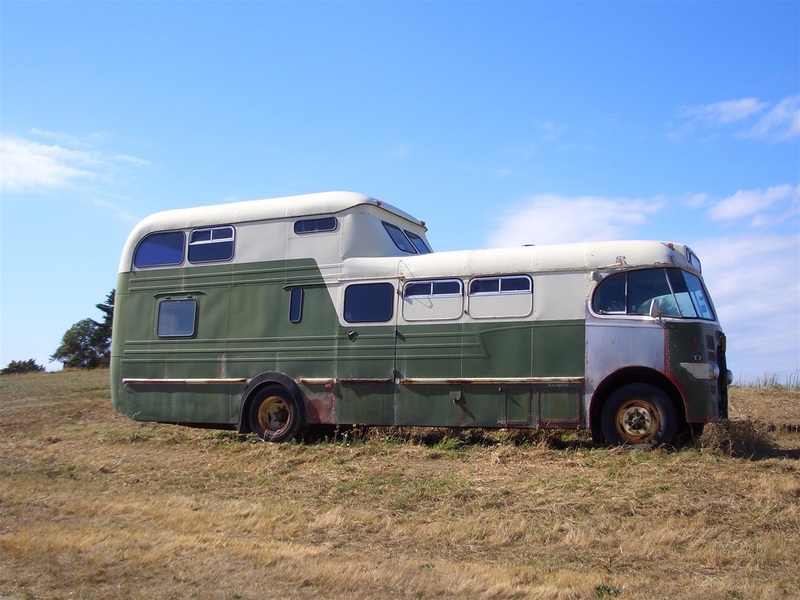 Old single-decker buses with the seats ripped out and equipped as a home, usually a luxurious although far from fancy home for a couple. We parked up and I toddled off for a shower, eyes peeled for the dog. The shower was excellent, but on my return there’d been a development. Shortly after I left a huge man, covered in tattoos and wielding a bloodstained knife had turned up. When Marigold had recovered from a heart flutter, it transpired the villainous man with the knife had broken off from gutting fish to ask if we’d like a beer and to share their barbecue meal. They were fishermen, lived there ten months of the year, and were fantastic hosts. Fish, straight from the sea, rice, potatoes, loads of ‘veggies’ and indecent amounts of cold beer were on offer. Typical of the hospitable nature of the New Zealand people. Back in Europe our van, our home from home, was a van-based camper van with scarcely any mod cons. Deliberately so. We’ve come across all types on our travels. 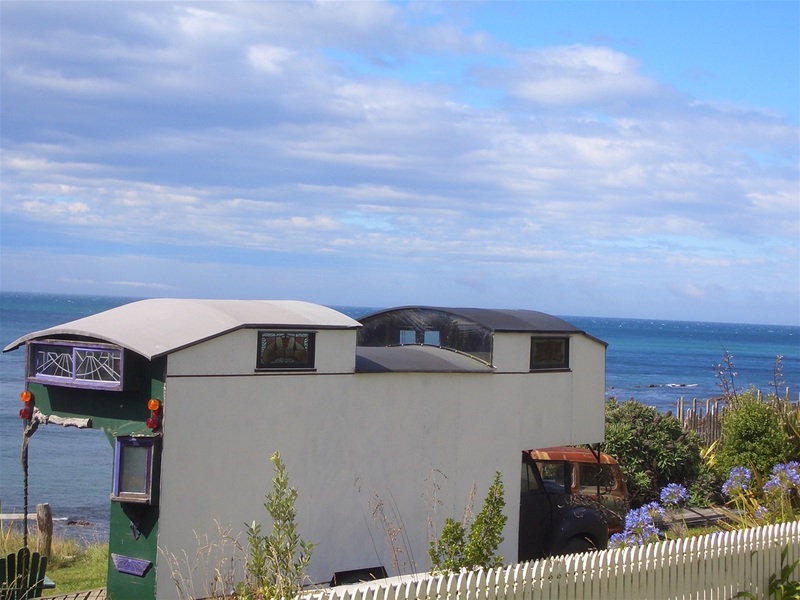 The converted buses, the American motor homes with wind-out extensions and the plush purpose-built vans with satellite TV, awnings and every conceivable luxury. Yes, they’re wonderfully comfortable, equipped with onboard showers, full ovens, domestic size fridge freezers and everything else that replicates what’s available in a house. The problem is, these luxury vans, they’re big. Seriously big in most cases. Of course, in an ideal world, we’d like access to comfort. Even a bit of luxury wouldn’t go amiss. So, why pick a small van without any of these amenities? In a word, access. 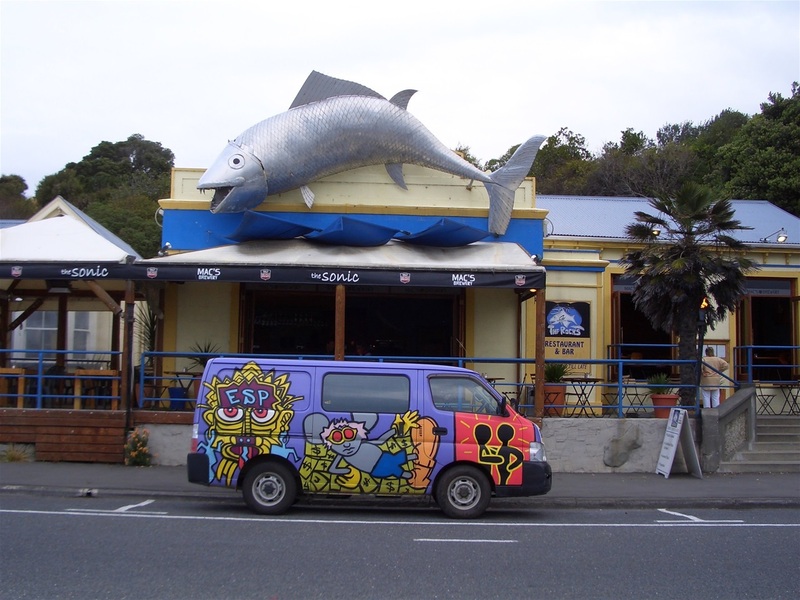 Life on the road in New Zealand, sleeping by the ocean, driving through the mountains or exploring towns and villages was a doddle in a small van. Back in Europe we’ve driven along winding lanes in Cornwall, parked up in the centre of Andalusian white villages and generally been wherever the mood takes us. 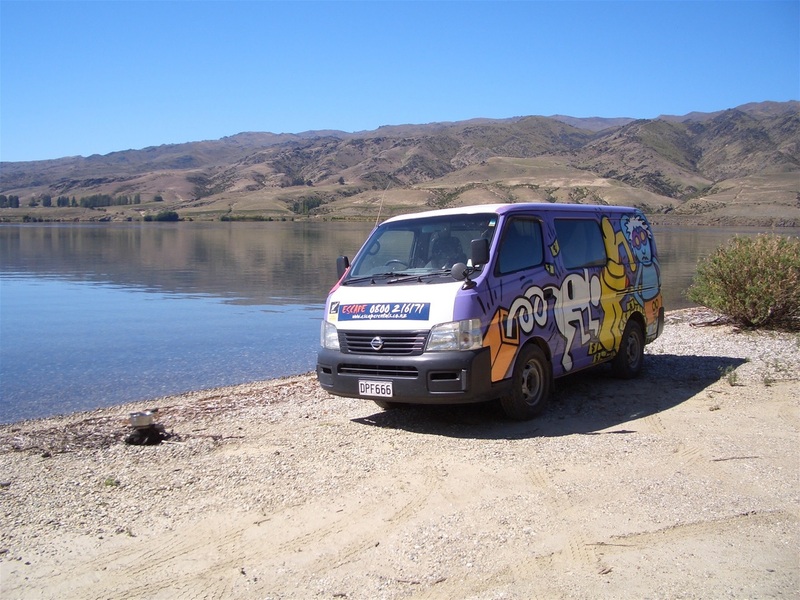 In a big van, we’d have to park a mile away, tow a small car or carry a motorbike to go where we’ve been. Nowhere near as convenient. We’re not exactly young, but we can rough it when we have to and the compensations far outweigh the inconvenience. Eastern Europe, North Africa, the Alps, the High Atlas, the Sahara desert, we’ve been there in our van, seen so much. Yet, still there's so much more to do, so much more to see. It won’t suit everyone, life on the road, but we’re never happier than when we’re wandering. Maybe a compromise is called for- we both hate the word and all its implications, but there it is - where we stay put for a spell and go off for what Marigold terms 'adventures' will bring the best of both worlds. That's the plan, for now. Plans, eh? We don't 'do' plans very often and when we do, they rarely stay in place for long. We're loving life where we are just now. The weather is great, the sea is on our doorstep and we know people here. Lovely people too. Even so, we decided today, on the spur of the moment, to set off again, so tomorrow we're off to Ronda. The coastal route and then head inland or through the mountains via Granada? Well, we’ll see what tomorrow brings before we decide. No set plan, you see? After that we may go on to Morocco, or we may not. We haven't settled on a plan for that as yet either. Camp fire life, see in front of van. Boiled eggs, probably. More Brits, but obviously need a bit more space than us. They came for a month and have been driving around NZ for two years! Easily done.